We will be looking at the interior of the church and shown some of the material that has been discovered in the archives. The pulpit of the church was carved by Anton Anreith and is regarded as the finest piece of baroque sculpture in the country. Preliminary research into a few of the archival records dating between 1780 and 1795 has demonstrated the importance of the documents. 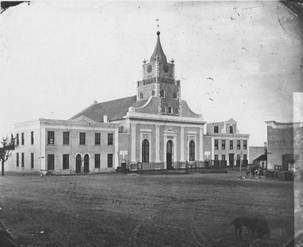 The Lutheran Church in Cape Town was constructed between 1764 and 1774, first as a simple but large warehouse because the Lutherans were neither allowed to have a ‘Church’ building nor to practice their religion. Nevertheless, the Church Council was constituted and operated underground while making continual requests for permission to worship openly. In 1779 permission to worship openly was finally granted, but with the following constraints on the insistence of the Dutch Reformed Church (the DRC was the only denomination previously sanctioned by the VOC). 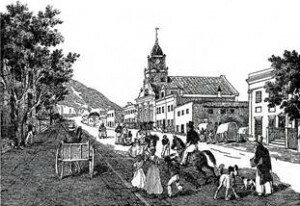 The building and the land of the Lutheran Church in Strand Street was donated to the community as a ‘permanent place of worship’ by Martin Melck and his wife Maria Margaretha Hop in 1774. It has the largest roof span of any known vernacular building in South Africa. The span is over 21 meters and the vaulted ceiling is similar to those in Lutheran churches in the Netherlands, Germany and Batavia (Jakarta, Indonesia). The Swan embedded in the plaster façade and carved in various places in the Church is the symbol of Luther. It is connected to a statement of John Huss (1370-1415), whose name literally means “Goose” in the Bohemian language and who was an important religious figure whose teachings strongly influenced Martin Luther and the Reformation. A parsonage was built in 1782 (Martin Melck House), which was declared a National Monument in 1936 and is still the last remaining ‘dakkamer house’ in Cape Town. Six years after the Martin Melck House was constructed, a sexton’s house was built on the other side of the Church (the Netherlands Consulate since the 1950s). Both were constructed with buttress walls between the buildings to support the Church. There is a beautiful spiral staircase built in one buttress, leading to the catwalk that runs below the windows in the roof structure. OUTINGS ONLY FOR PAYING VASSA MEMBERS!